I know we have already posted a test between the Audi R8 V10 and Nissan GT-R. 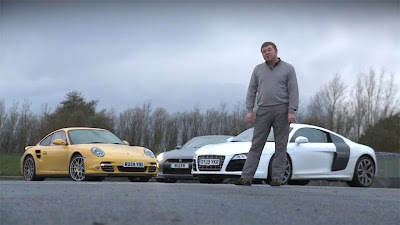 However, not only is this video in English, Autocar has thrown in a Porsche 911 Turbo to make things a little more interesting. Unfortunately, the Audi had some brake problems, so I wouldn't call the race entirely even. Still, good for an entertaining 5 minutes, even if you already know the outcome.